OneTwoTrip, a trusted online travel service that helps travelers go on holiday or book a business trip to anywhere in the world. The company has been operating in Great Britain, Germany, Ireland, Spain, Kazakhstan, Poland, Russia, USA, Turkey and Ukraine since 2011. More than 2.5 million travelers use their website and mobile apps for iOS and Android to book their travel. Help center is an indispensable part of OneTwoTrip Customer Support as travel industry requires them to be ready to assist their clients 24/7. With that in mind, OneTwoTrip wanted to change the look and feel of their Help Center. They had a mockup and looked for a partner that would build their brand new Help Center theme and integrate it with full Zendesk functionality. To achieve a completely new look of the Help Center we made significant changes of the Flatrock theme and sidebar navigation. We divided content into three levels (Product - Category - Article) using Zendesk API. The first two levels are located in the sidebar, while a list of articles is on the right. One more customization we made is related to images in the header. Background images change in accordance with the selected language. 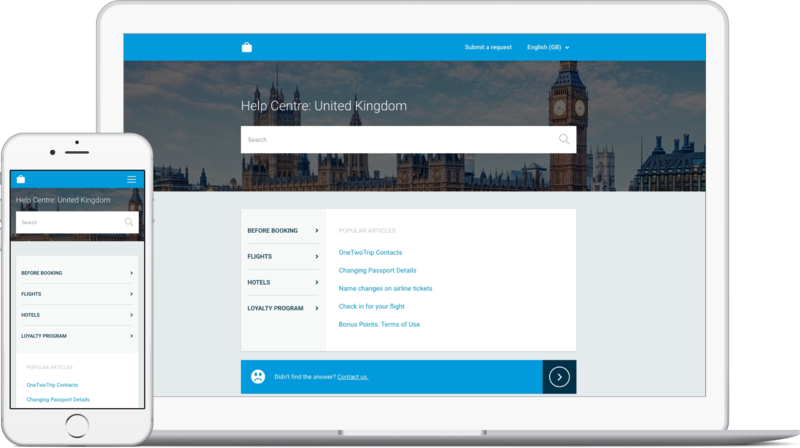 We created a customized demo Help Center so that OneTwoTrip could test all the functions on all devices and make amendments. After everything was agreed, we installed the modified theme into their Help Center. Ready to have a snazzy Zendesk theme with your customers in mind?